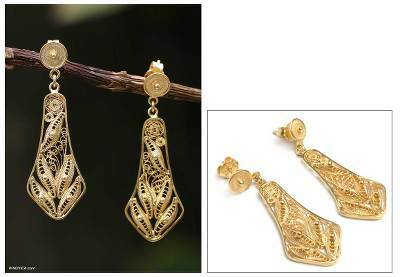 Handmade Gold Plated Filigree Earrings from Peru, "Bells"
Peru's Giuliana Valz-Gen shapes exquisite filigree earrings, executed by hand with threads of sterling silver. Finally, they are bathed in 21k gold to achieve the appearance of an antique heirloom. Filigree is exceptional! Will be looking for other pieces by this artist. Done with posts which helps them feel secure. Received compliments on first wearing; expect this will continue. To replace a lost earring replace the pair.